Russia's U.N. 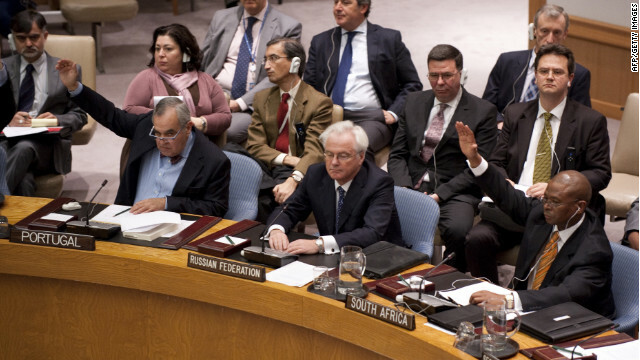 Ambassador Vitaly Churkin cast a veto against a resolution on Syria in the U.N. Security Council on Saturday. Editor's note: Shadi Hamid is director of research at the Brookings Doha Center and a fellow at the Saban Center for Middle East Policy at the Brookings Institution. The views expressed in this article are his own. A last-ditch effort to put an end to the bloodshed in Syria failed on Saturday, with Russia and China exercising their veto at the United Nations. With that fateful decision, the conflict moved to another, more dangerous stage. Those who warn that Syria will descend into civil war are a bit behind: It is already in civil war. Now it will only intensify. In the months leading up to the U.N. vote, Syria's opposition has grown more militarized. Rebel forces, under the banner of the Free Syrian Army, gained considerable traction after a shaky start. The U.N.'s failure to act may have been the best recruiting tool the FSA could have hoped for, and its ascendancy is now a nearly foregone conclusion. Meanwhile, after first opposing any resort to armed resistance, the Syrian National Council, the country's most representative opposition body, has made an important shift. It has now "pledged to support" the FSA, and the two groups are attempting to increase coordination. Where does that leave the international community? The U.N.-endorsed norm of "responsibility to protect" (sometimes boiled down to "r2p") mandates a collective response when states wage war on their own populations. The Syrian regime, however, is making a mockery of the notion, with its brutal assault on the city of Homs just as the U.N. vote was taking place. Either the international community takes r2p seriously, or it doesn't. We have to decide. As I've argued before, military intervention remains premature. But, in light of recent events, the time has come to carefully consider the various military options available, determine their feasibility, and begin to judge whether they would cause more good than harm. Of course, no one should take such intervention lightly. But just as proponents of intervention must make their case for how the military option could "work," opponents of intervention face a similar burden of explaining how staying the current course will work. If the opposition itself has chosen the military option - and this seems increasingly the case - then the question is this: Can a ragtag army of perhaps 10,000 Syrian rebels defeat an army that while, far from invincible, enjoys an overwhelming advantage in numbers, equipment and firepower? The opposition may have millions on their side, with Syrians continuing to protest en masse throughout the country. But it's difficult to see anything less than a disastrous stalemate without the international community helping to tip the balance. « Previous entryNATO: From military alliance to talk shop? That's funny. I thought that both the C.I.A. and the British MI-6 have been aiding the Syrian "rebels" all along. Maybe if they'd only quit doing this, this uprising may end peacefully! Remembet, your Government always knows what's best for you. Even if the have to kill you to prove it! If we want to solve Syria, we need to isolate them from their support in China and Russia. We also need to resolve the Iranian nuclear problem. Without these two issues resolved, military intervention could end up being worse than useless. There is no way that a western coalition could unite Syria if Israel attacks Iran. Having a proxy war in Syria with Russia and China is also unacceptable. It will cause significant loss of life to achieve nothing. The west would struggle to pay for an intervention as it is, even without competing against other large nations. Even if these obstacles are resolved, I'm not confident that this intervention would be a good idea, but I do think it would end up saving lives in the short term. True innocent Syrians shouldn't be left to their devices at the mercy of Assad's butchers! The actors in the region should get themselves involved. They should be concerned about the security in the backyard. Despite its reluctance to intervene, the West can still supply aid and support. It's deplorable that China and Russia turn their blind eye to children being killed. we fought our own civil war let them take care of themselves. yes its sad but we have our own problems to deal with right now! Fighting terror with terror is a no-win proposition. The West must not allow FSA to become another IRA. That conflict cost thousands of lives and unspeakable cruelty. I would rather impose economic sanctions on Russia and China, for voting that the bloodshed continue. They will go into history as the greatest cowards. I wont mention names, you know who I mean ... the "macho men". Desert voice: How ridiculous! How liberal! Is voting a sort of democratic process used to give all sides an opportunity to freely express their opinion? Now you suggest punishing some of them for voting wrong? You suggest to impose economic sanctions on countries for doing what was their right according to valid international agreement – they have right to vote and veto whatever they choose whenever they choose. Or do they? Who are the Rebels and why would we support the rebels when the transition military high council seems to have a split in leadership in taking over the free rebel army? Are you advocating backing Rebels we don't even know who is really in charge? We know a few things. Iran and Syria are allies. If Syria went down it would isolate Iran and put them on the defensive and maybe have to concede a political loss or go out fighting. This could be why they are waiting. Now a report comes out saying Pentagon is looking into possible attacks in Syria, this reporter is telling us to support the rebels. I tend to think we are getting lead here. They may be doing this whole Iran thing as pretext to get the Middle East back under control of the insiders, bankers, elite, movers and shakers we don't hear about, so puppets and already friendly ME dictators like Saudi's, Yemen and Bahrain, allow to continue. Not to mention, puppet Obama is trying to get re-elected in an economic down turn, war may be the machines only answer at this point. It's looking pretty desperate no matter how it goes. Get ready folks. "Former Russian Prime Minister, ex-head of foreign intelligence and renowned Mideast expert Yevgeny Primakov says events in Syria are no drive for democracy but efforts by foreign states to displace the country’s leader over close ties with Iran." CNN: "Those who warn that Syria will descend into civil war are a bit behind: It is already in civil war. Now it will only intensify." there are an estimated 10,000 Syrian rebels in total, The population of Syria is an estimated 22,717,417. how exactly that could become a civil war, no idea. Maybe if the US intervened they could make one. It is sad, but the truth is that the West does not have the stones to face off against Russia and China WRT Syria. When you hear all the videos of the Syrians asking "why are you not helping us" the answer is clear: no one really has any empathy in the West for Syrians (or most arabs in general). That's not a racist or xenophobic statement, rather it is based on the fact that, after decades (really centuries) of Islamic fundamentalism (the waging of Jihad against us, the "infidels" – fakir), the West does not have oodles of sympathy or empathy with Arab Muslims. We can and do empathize with non-violent Buddhist Tibetans. But a crowd of frenetic Muslims shouting "Allah who-Akbar" does NOT create waves of positive emotions in us Westerners. And really, they ARE getting slaughtered, but no one faced the Alawites down in 1970 and Russia backed Assad (senior) to the hilt.. . so one more Muslim arab nation is repressing its citizens. That is the Middle East. The only reason Libya was a target for regime change was: it was an easy victory. The Libyan Army was primitive, easy to overcome. Syria, on the other hand, as the most modern Russian armament. And it has the blessing of Putin. So mess with Assad, and you mess with Putin. And who wants to face down a KGB guy like Putin, right? And don't forget: Iran is a friend of Syria too... so what do you do? Sit back and watch the Syrian army butcher its own civilians. The Syrian Secret Police is very strong. I had a friend who went to college with me, and her dad was in the US Embassy in Damacus... she was followed everywhere by "handlers", government agents. Watched.. the whole nine yards, while she was there. The Syrian Secret Police in war against Israel made a line behind the front troops and if/when they retreated, the Secret Police would simply shoot them. THAT is the "humanity" of Syria. If someone manages regime change there, AWESOME. But I am not holding my breath. And if it does happen, don't you think that the Syrian version of the Muslim Brotherhood will step in after the liberals go home, just like in Egypt?